Rob Pruitt presents the second act of the exhibition project carried out for the Gallery in three stages betweeen September 2009 and March 2010. 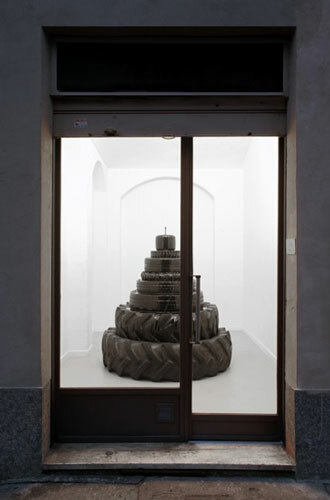 The American artist realizes a long-term installation in the Site Specific space in Piazza Santa Giulia 5 presenting one of his 'fountains', formed by stacked tyres of decreasing size, from the tractor wheel to the go-kart one, in which engine oil replaces water. The fountain's traditional monumentality and its social function are brought into question by the use of everyday objects that are ironically decontextualized and given a completely different function. In accordance with the pop sensibility that permeates his work, Pruitt suggests the opportunity to express his own creativity in the daily life with simple means and acts. Everything the fountain can mean in historical, artistic and social terms is therefore translated by Pruitt into a synthetic contemporary language.